As every die-hard Cubs fan knows however, the team’s success cannot come easily. Never could they imagine the hurdles this club would face in its attempt to reach the World Series for the first time since 1945. No club in baseball history has ever had to overcome the challenges that suddenly are thrust upon these Cubs. The Curse: Cubs Win! Cubs Win! … Or Do They? by former major league player Andy Van Slyke and veteran baseball author Rob Rains takes readers along for this thrilling fictional journey that involves much more drama and action than just winning and losing games on the field. 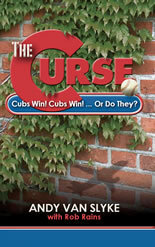 Written with the inside baseball knowledge that only someone who has spent a lifetime working in the sport can provide, the book uses a fictional backdrop to revisit many of the Cubs’ failed pennant pursuits of the past – the Curse of the Billy Goat; the late season collapse in 1969; watching the ball squirt through Leon Durham’s legs in the 1984 playoffs, and how Steve Bartman got in the way of the 2003 pennant-clinching moment. More than just a baseball novel, this is a story about the bond that exists between fathers and sons, the bond that exists between a team and its fans, and the dangers of the lust for power, glory, and money. Cubs Win! Cubs Win! ... or do They? Andy Van Slyke played in the major leagues for 13 years. He won five Gold Gloves and was a three-time All-Star selection. He was almost as well known for his quick wit as he was for his baseball ability. He has spent the past three baseball seasons as a coach with the Detroit Tigers. Van Slyke provides the inside knowledge that makes this book stand out from other baseball novels. Van Slyke was the co-author of Tigers Confidential, the Untold Inside Story of the 2008 Season. Rob Rains is the author of 28 non-fiction books, most on baseball, including autobiographies or biographies of Tony La Russa, Mark McGwire, Ozzie Smith, Jack Buck, Red Schoendienst, and Dave Phillips. He currently is the sports editor of St. louis Globe-democrat.com, an online daily newspaper, and an adjunct professor in the school of communications at Webster University.